Little more than a decade ago, China was a relatively minor actor in global investment and finance. By 2014 it had become the second largest global investor, second only to the United States. Outbound investment has been made possible due to strong backing from the Chinese state and financing from its policy and commercial banks. 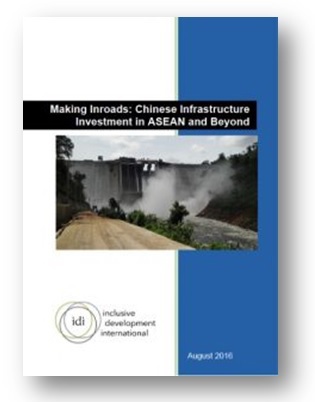 In recent years, China has promoted the establishment of new financial institutions and initiatives, including the multilateral Asian Infrastructure Investment Bank (AIIB). China has also established investment funds such as the Silk Road Fund to provide further capital for outbound investment. These new institutions focus heavily on infrastructure development, and with support from its One Belt One Road initiative, China is set to expand its role in global infrastructure financing significantly in the coming years. This publication seeks to increase public awareness of these institutions and initiatives, how they will potentially impact on local communities and the environment, and what environmental and social standards and governance systems they have adopted. It also discusses strategies that civil society groups could deploy to respond to these developments and influence the policies, projects and operations of Chinese-led finance institutions. Seven chapters of the report include; The Evolving Role of China in Global Finance, The Asian Infrastructure Investment Bank, The One Belt One Road Initiative, Chinese Investment Funds Operating in the ASEAN Region, China's Policy Banks: Financiers of the Going Out Strategy, Implications for Instrastructure Financing in the ASEAN Region, and The Growth of Chinese Overseas Finance and Investment: Opportunities for Civil Society to Respond. Brief factsheets on key sections of the report will be published soon in English, Khmer, Vietnamese and Burmese. Inclusive Development International (IDI) is a human rights organization working to make the international economic system more just and inclusive. IDI supports and builds the capacity of grassroots organizations and affected communities to defend their land and human rights in the face of harmful trade, development and investment projects. Through research, casework and policy advocacy, IDI works to strengthen the human rights regulation and accountability of corporations, financial institutions and development agencies.